It seems like I have been running non-stop since January. The calendar has quickly flipped pages and I find myself almost at April! Passover is a good time to sit back and think about all we have to be thankful for - freedom, family, friends, and all these crazy opportunities that keep me bouncing around with a full schedule. I haven't had a chance to post my photos or write up any recipes from our mini-Seder from last night, but here is a link to some of my Passover treats from last year. I made the same brisket and am planning to make a batch of chocolate covered matzoh later in the week. To all a who are celebrating, I hope you had a wonderful Seder. To those of you preparing for Easter, save me a few cookies and chocolates for after Passover. Since I've been away on vacation I'm a little behind in my cooking and blog posts. Instead, I'd like to introduce a new guest blogger - my best friend Beth! She's been a vegetarian for a long time and will hopefully add some tasty vegetarian recipes to the Good Cook Doris recipe box! Enjoy! While I enjoy cooking, complicated recipes intimidate me. I am easily overwhelmed by multiple steps and long lists of ingredients - especially when I haven't heard of all of them. I can proudly say that in my many years of vegetarianism, my repertoire has recently greatly expanded. Good Cook Doris must take some credit for my new found confidence in the kitchen as it has helped to teach me, guide me and, above all, inspire me. Thanks Lara! Here is a vegetarian sloppy joe recipe, adapted from a Rachel Ray cookbook, that I made it a few days ago to be enjoyed by omnivores and carnivores alike. I added a slice of sharp cheddar cheese and a pickle before serving. The leftovers are easy to reheat and taste great too. 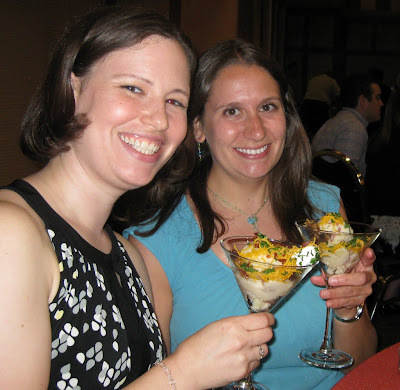 The 2010 March Daring Cooks challenge was hosted by Eleanor of MelbournefoodGeek and Jess of Jessthebaker. They chose to challenge Daring Cooks to make risotto. The various components of their challenge recipe are based on input from the Australian Master Chef cookbook and the cookbook Moorish by Greg Malouf. You can call me crazy, but I’ve added another thing to my ever-growing list of activities. Last month I joined the Daring Kitchen – a few of my blogger friends are members – as a way to challenge myself to try new recipes and techniques that I might overlook. Too my delight, my first official challenge is something that has been on my foodie to-do-list for quite some time. I present….RISOTTO! Within the last few months, I’ve devoured some deliciously creamy and wonderful risottos at a few Boston area restaurants (and some arancini too). I was always wary of making it at home because I thought it was quite labor intensive and difficult. With this challenge I had no excuse not to try making risotto myself. The challenge called for two things: homemade stock and risotto using the stock. I knew I had a busy week, so I made the stock a few days ahead of the risotto. I found a few chicken stock recipes online and one in my trusty Joy of Cooking book. I cooked, simmered, and strained my way to a flavorful homemade stock. For the risotto I decided to branch out from the recipes given and find an ‘easy’ one to attempt. My first stop was my Google Reader blogs and I came up with a winning recipe in a post on We Are Not Martha. 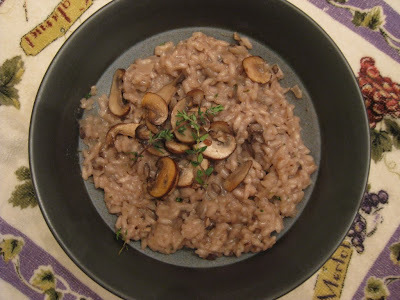 They posted a step-by-step account of a mushroom risotto recipe from http://foodiereflections.com/ that looked easy enough to execute. I made a few tweaks of my own to the recipe. Being the only wine drinker in my house, I don’t always have a big selection on hand. When I went to the wine collection for a dry white, the only white to be found was a not so dry Riesling. I chose to use a semi-dry red wine that I had picked up in my home state (Missouri) during my last visit home. I was also having a stressful week, so I opted to mince all the mushrooms, onions, and garlic by hand to decompress (the recipe called for the food processor). I used a large, wide bottomed Le Creuset Dutch oven and a wooden spoon for stirring (it seemed traditional!). While I did have to stay in the kitchen to stir for the whole time, I watched TV and cleaned up my mess while I cooked. The result was an unbelievably smooth, rich, mushroomy dinner. I only wish that I had made a triple batch because there wasn’t much leftover for lunch the next day. I’m looking forward to adding risotto to my regular dinner rotation (so is the hubby). Here’s the recipe and the result! Looking forward to the next challenge! Stir in the minced garlic and cook for 30 seconds, then add the mushrooms. Cook for 2 minutes, stirring often, then mix in the Arborio rice and cook for 1 minute. Pour in the wine and stir until the wine has been absorbed by the rice. Hola! Just a quick post to highlight some of the delcious food we've been enjoying in Spain. 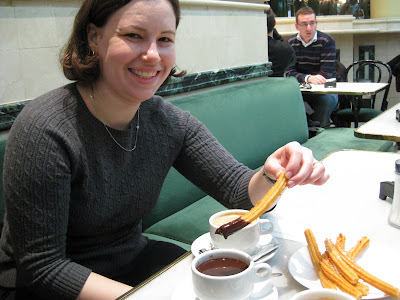 The hubby is taking a siesta (too many churros...) so I decided to log on and share a few photos. We started our trip in Madrid and sampled many of the local specialities! 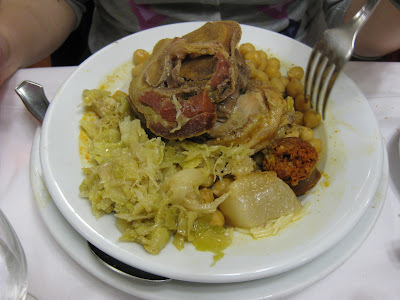 On the recommendation of a friend from Madrid, we went to La Taberna de la Bola for a madrileno specialty - cocida. It's a slow cooked beef and chickpea stew. Of course, we couldn't pass up churros with chocolate. They were fresh and hot, served with a thick, melty cup of hot chocolate. 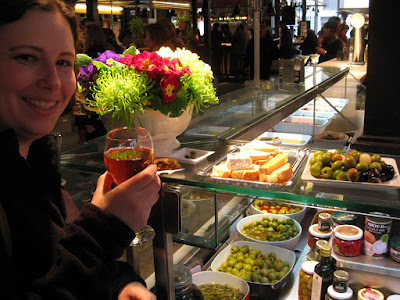 We visited el Mercado de San Miguel a few times during our stay. We couldn't resist the aceitunas (olives) of all varieties - right next to a "queso & fromage" stand. The best were the pickled olives and mini-pickles. 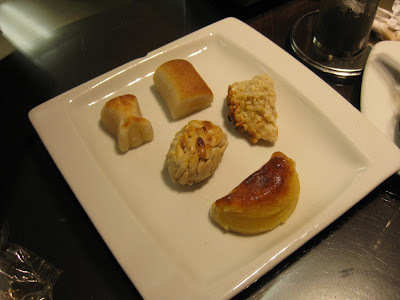 And the last photo to share is the specialty of Toledo - mazapan (or, marzipan). As the hubby commented, the Spanish spelling and pronuciation is the way most Bostonians pronouce "marzipan"! Many more photos and descriptions to follow. Hasta luego!